Oluwalase Babatunde Benson is the number 1 car spotter in the village - maybe even the world! The road through No. 1's village is full of holes. There are no cars for No. 1 to spot and no customers for Mama Coca-Cola's roadside cafe. Mama Coca-Cola tries to get the road fixed but she fails. Grandfather says, "No. 1, you have a No. 1 brain. Use it to fix the road." What can a small boy do? On Cousin Homework's wedding day, No. 1 still hasn't come up with a solution, but he does figure out a way to get everyone to the wedding. And when Mama Coca-Cola asks him to sell her goat at market, he returns home with two goats instead. Finally he has a brilliant idea - one he is sure will get the road through his village mended. Atinuke was born in Nigeria and spent her childhood in both Africa and the UK. She works as a traditional oral storyteller in schools and theatres all over the wolrd. 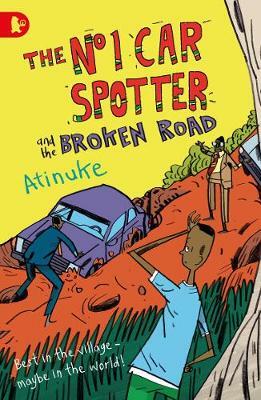 Atinuke is the author of two children's book series, The No. 1 Car Spotter and Anna Hibiscus. She lives with her two sons on a mountain overlooking the sea in West Wales and supports the charity SOS Children's Villages. Warwick Johnson Cadwell lives by the Sussex seaside with his smashing family and pets. Most of his time is spent drawing or thinking about drawing, but for a change of scenery he also skippers boats.